STELLA, the late winter storm, slammed the eastern seaboard of the US, bringing cities to a standstill. 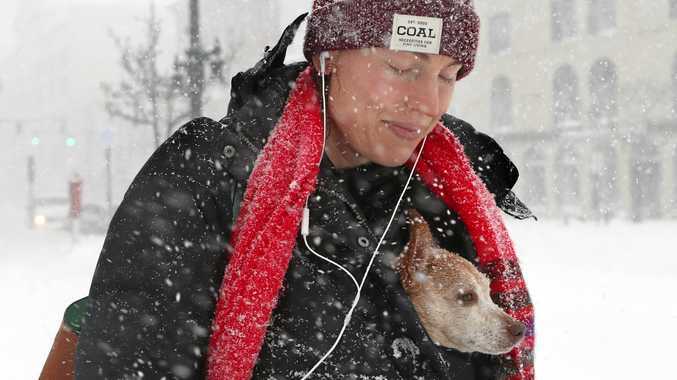 The National Weather Service called it a "rapidly intensifying” storm that affected about 50 million people from Virginia to Maine. Parts of northern Pennsylvania reported nearly 40cm of snow before 9am on Tuesday, with the mountains there and in upstate New York recording 60cm. However, previous estimates on record breaking snow and blizzard conditions were scaled back when it was clear the storm would include freezing rain, not massive snowfall, for New York City. New York can now expect 10-20cm of snow in the next day. Many people further inland and in New England are still expected to get up to 60cm. New York, New Jersey, Virginia, and Pennsylvania have all declared states of emergency and drivers have been told to stay off the road because of visibility and sleet and ice formation. Schools closed for the day in many areas.